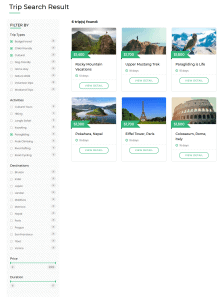 Trip Search is an extension for WP Travel Engine that provides a one-step trip search engine to search trips by Destination, Activities, Duration, and Budget on your travel website. Fixed Trip Starting Dates is another extension for WP Travel Engine that adds Fixed Starting Dates for a trip. If the add-on is added, then trip can also be searched according to the Trip Starting Dates. Trip Search requires WP Travel Engine plugin installed. Trip Search indexes all the trip posts and adds destination, activity, duration, budget, and trip starting dates as search filters in a drop down. Search by Destination – User can search for trips by Destination such as Pokhara, Mustang, etc. Search by Activities – User can search for trips by Activities such as Paragliding, Rafting, etc. Search by Duration – User can search for trips by Duration such as 5 days, 10 days. Search by Budget – User can search for trips by the Budget range. Search by Trip Starting Dates – User can search for trips by Trip Starting Dates. User can select filters on the Trip Search Result page as well to filter trips. To configure Trip Search Extension, go to Trips > Settings > Extensions. You can choose which filters (destination, activity, duration, budget) to exclude from the search. If the Fixed Trip Starting Dates add-on is added, you can also choose Fixed Starting Dates filter to exclude form the search.